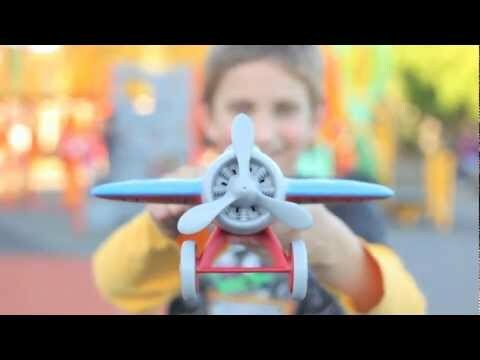 The Green Toys Airplane is one aircraft Mother Nature is happy to clear for takeoff! 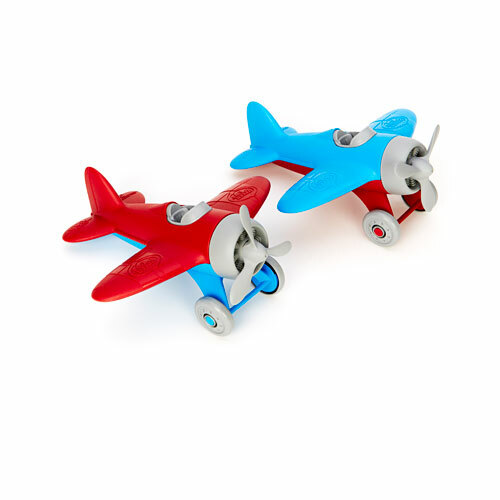 Made in the USA from 100% recycled plastic milk jugs that save energy and reduce greenhouse gas emissions, this single-seater plane features a spinning propeller, two-wheeled landing gear, and racing stripes on its rounded wings. Imaginations will soar to new heights as pilots-in-training practice loops, rolls, and spins with this eco-friendly flyer. The lightweight design and tapered, easy-to-grasp body shape let even the littlest aviators ascend through flight school with ease. No BPA, phthalates, PVC or external coatings, and also meets FDA food contact standards. Packaged with recycled and recyclable materials and printed with soy inks. Recommended for ages 1 and up. Please select the color if you have a preference, but note we may be out of stock. You can contact us to check if we have a specific color in stock.